With the 2018 edition of the Winter Olympic Games and Winter Paralympics, South Korea hosts its second Olympics after the Summer Games of Seoul back in 1988. In late October, the Olympic torch set of on its journey from Greece, reaching South Korea on November 1. There, it is relayed by 7,500 torch bearers, representing the country’s 75 million population, to reach the opening ceremony on February 9. By adding four new disciplines, the international event will be the first Winter Games to extend over 100 medals, spread across 15 sports. This 300 m false-colour scene was captured by PROBA-V just two weeks before the start, on January 21st. 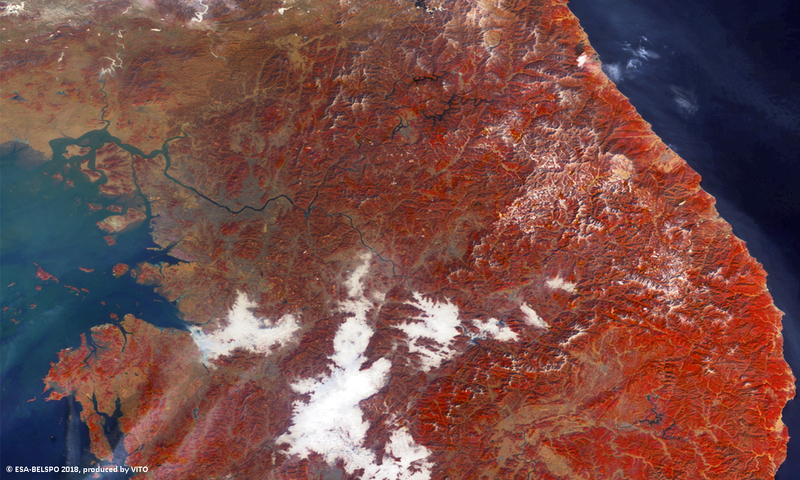 It shows the northern part of the country, highlighting the mountains as a white network against the red tones of the vegetation.